Prismacolor Pencil and Gamsol Coloring Tutorial - "Something To Crow About"
True :D here with another coloring tutorial for you. Today we are going to color the "Something To Crow About" image that I illustrated for Clear Dollar Stamps with Prismacolor pencils and Gamsol. The first thing I did was pick the paper that I wanted to use for my card so I could color coordinate the pencils that I was going to use. I'm using a piece from K&Company's - "TC Country Cottage" stack. Here is my paper and the items I will need to color my image. I have already stamped it onto a high quality heavy cardstock with a water-proof black ink. I start with the lightest colors first on this image. If you do dark first, you might pull darker colors into the yellows. Add a touch of PC1082 - Chocolate to the darkest areas of the yellow and blend with Gamsol. Shade the stem and leaves with PC988 - Marine Green and blend with Gamsol. Lightly color in the crow and flower center with PC1082 - Chocolate and blend with Gamsol. Add some shading to the crow and flower center with PC1099- Espresso and blend with Gamsol. Add some darker shade values with PC1058 - 90% Warm Grey and blend with Gamsol. Lay in a little grass with PC1005 - Limepeel and blend. Add some Limepeel for the irises of his eyes and then outline them with Prismacolor Veri-thin pencil #739 1/2 - Olive Green. Do not blend. It is too small of an area. I kept the lay out of the card simple so the focus would be on the pretty paper and my image. Help us welcome our new Illustrator and tutorial writer! Help us welcome Trudy Sjolander to our Illustrator team and our blog! Many of you have come to know Trudy through her beautiful card designs she has been doing as part of our Design Team. We have been talking behind the scenes for some time now about her cute doodles becoming a part of Clear Dollar Stamps. She also does beautiful coloring and I thought everyone would enjoy learning some of her coloring tips and techniques right here at Clearly iStamp! Trudy will be designing stamps that are a little larger and open for coloring.....so she can teach us to color, as well as some very detailed stamps! I'm so excited to welcome her to the Illustrator team and our blog tutorial team! Hi! My name is Trudy, but friends call me True. I live in the heart of the USA...Kansas girl born and raised! I have been happily married to Robert, my high school sweetheart and the love of my life, for 28 years and have a wonderful 24 year old son Kurt. I work full time building airplanes, but craft in my spare time. I have dabbled in arts and crafts all of my life working in a crazy amount of mediums. I started stamping and card making about a year and a half ago and fell in love! I have been very blessed to have made so many new friends through my stamping and blogging! Ever since I started, I have been thinking how cool it would be to have some of MY images published as stamps. I have worked on about a dozen design teams and have enjoyed that tremendously. 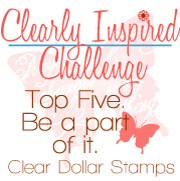 Right now I am on Clear Dollar Stamps DT. Lori from CDS saw some of my "doodles" and that started the ball rolling! I am getting my images turned into stamps! Whoop whoop! I am so excited! I hope to create images that you will love to look at and love to work with even more. Come visit my blog and learn a little more about me and my love for creating. 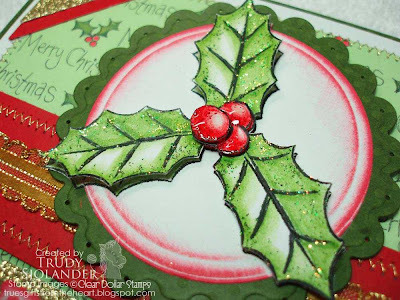 Trudy's first tutorial and stamps are below.....enjoy! Have you ever wondered how some people get their images to look dimensional? I don't mean cutting out layers and popping with foam tape type dimensional. Although I do that on most of my cards too. :) A lot of people have a tendency to fill in the entire image with the same shade of color. That is perfectly fine if that is the look you want. If you have wanted to try doing it the other way, this quick and easy tutorial might just be what you need to get started. 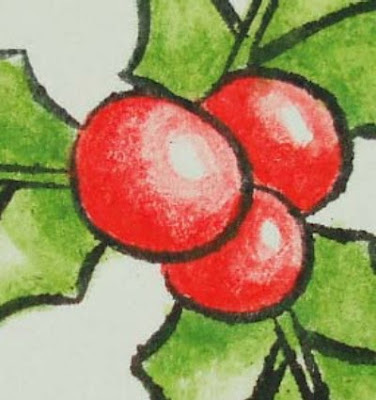 I will use this simple holly image that I illustrated for "Clear Dollar Stamps" for this example. I stamped it with black Staz-On because it is a good waterproof ink. There are others that work well too. You will have to experiment to see which you prefer. 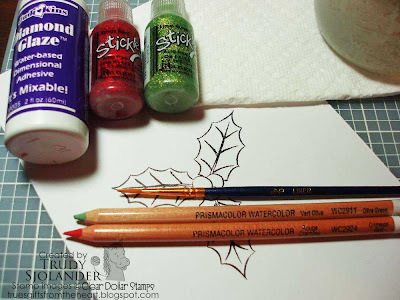 Wet/heat embossing your image is another great option for watercolors. I only used two watercolor pencils on this image. Olive Green and Crimson Red, but because of shading, it looks like there are more colors than that. I use Prismacolor watercolor pencils but most other brands will work just fine. The very first thing you need to do is imagine where your light source would be coming from. I usually picture it in the upper right hand corner of my images so the areas on the berries and the leaves that the light hits most will not get colored in. This gives you your light values. Notice on the leaves that the lighter part is not necessarily the part closest to the upper right hand corner. 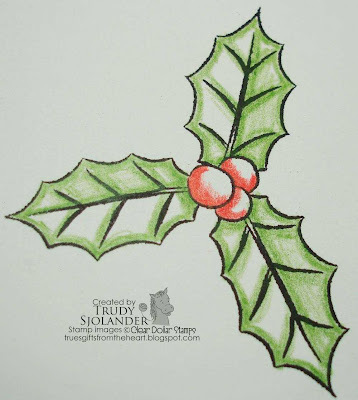 This is because I know that holly leaves fold up so there will be shadows cast on the closest parts and the light will be brighter on the other half. There will also be more shadow around the berries especially on the leaf farthest away from our imaginary light source. The veins of the leaf will also be a little darker because they are normally recessed and will be shadowed. OK...enough of the preliminaries....let's get to the fun part! Take your green pencil and draw about an 1/8th inch around the inside edges of the leaves and along the veins with a slight pressure to get a nice dark line. Don't worry about being too careful, it will get blended with water and smoothed out. You will want to stay in the lines though. On the parts that will be shadowed you can go ahead and color in very lightly. Now with your red, color in the shadowed areas of the berries but avoid the light side, you will pull some color around with your wet brush later. I like to use a smaller brush (5/0) which makes it a lot easier to do smaller detail. Dip your brush into a cup of water then dab it on a paper towel. You want it damp, not dripping. I work the light halves of the leaves first by going around the edges, then quickly brushing farther into the image to pull a lighter shade of color in on some of the white. The shaded leaves are just the opposite. Start in the middle areas where you lightly colored then work your way out to the darker edges. You might try just doing a section at a time. You do not want to spend a lot of time rubbing around in the same spots because it can rough up the paper and it won't look as nice. The berries are a little different because red is such a vibrant color in watercolors. Note: when coloring a round object, you want to use curved strokes. 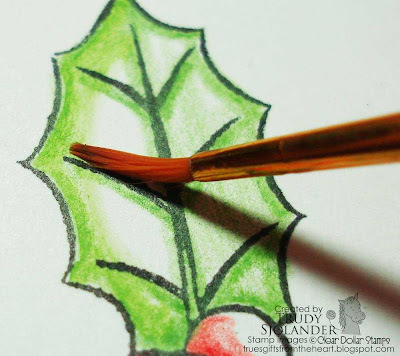 With a damp brush and on one berry at a time, smooth out the red where you have colored avoiding the white areas. You will want to rinse your brush before you pull red over to the white areas. Work in a circle avoiding the very center of your light spot to keep your highlight white. If your shadows are not dark enough, you can wait until your image has dried and hit the areas you want shaded more, lightly with the pencil. 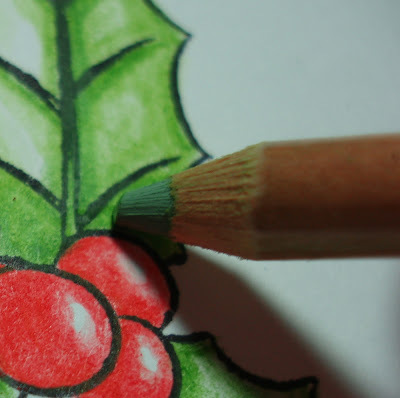 (If you try adding more pencil while your paper is still wet, your color will be too dark and blotchy). After you have hit the dark areas again, go back over just those areas with water to set the color. That is it...too easy right? ;) If you want to jazz up your image even more, you can do multiples and cut them out and pop with foam dots, add glitter or shine. 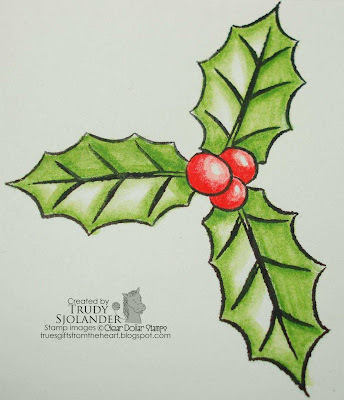 On my example, I used Ranger Stickles in Lime Green and Xmas Red. I also used Diamond Glaze on the berries to make them shine.